by the foremost contemporary Makers in the UK. Since 1974 I have been showing and selling the work of makers whose work is individually conceived and made  one of the longest established galleries in the country of this type. I have now retired from running the gallery in Brighton. Please see the News Page for further details. 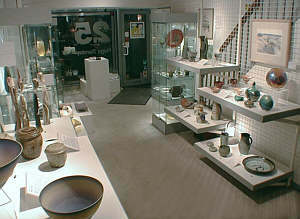 Much of the information in this site will be retained as an archive record of the gallery up to 2001. We use a navigation toolbar in its own frame for navigation. In certain circumstances it is possible to lose the toolbar - for instance if you drag a text link in Microsoft Internet Explorer (versions before 4.0). If this happens, just click the 'Home' text link at the bottom of any page on the site and the toolbar will be reloaded.